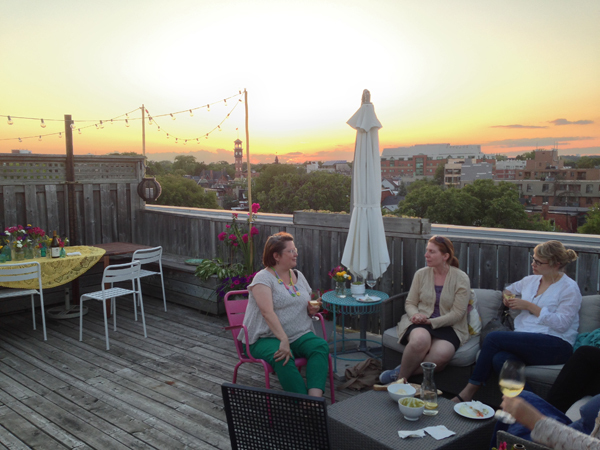 I can’t believe it’s taken me this long to host a fab rooftop summer event. 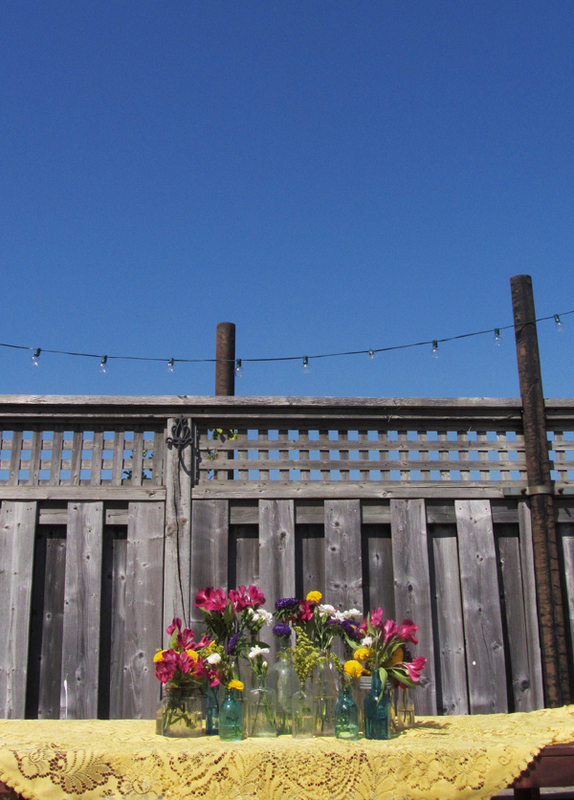 There may have been a little bit of a delay getting the patio up and running this year but the lights are hung and the flowers are blooming so we’re in business. 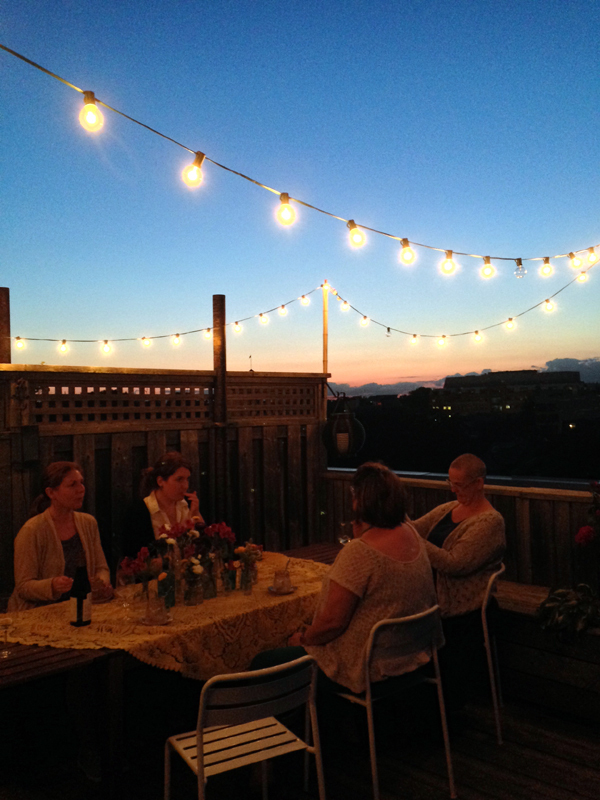 The first order of business was hosting a wine & dine get together with some great ladies. I wear so many creative hats these days and I really can’t choose what I love most. I get so much joy pulling together an event. I especially enjoy the smaller events because you can put even more effort into the details. Flowers, food, decor, yes, yes and yes. Add some Chardonnay and you’ve got yourself a party, which is exactly what we did. I decided to keep things relatively simple in the decor dept. 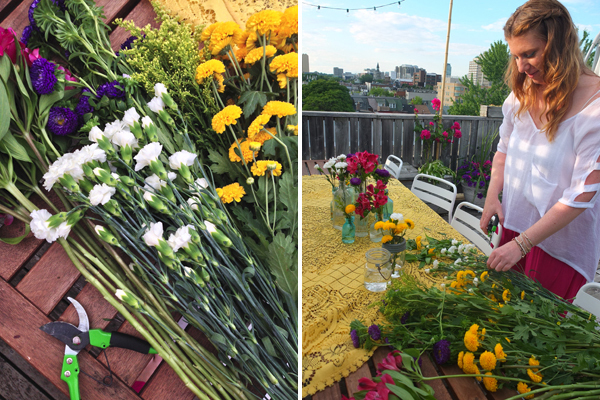 The patio kinda speaks for itself so I just went with some flower stems in bright summer colours and a grouping of vintage bottles over a cheerful yellow lace tablecloth (thrift store score). It made for a lovely centrepiece. The flowers were pretty but people came for the wine & dine part…and to see me of course. This event was generously sponsored by Kendall-Jackson wines and the perfect backdrop to try their popular Vintner’s Reserve Chardonnay. If you can’t go to California, bring California to you that’s what I say. The wine is made from 100% Jackson Estates Grown grapes grown in their vineyards along the coastal regions of Monterey County, Santa Barbara County, and Mendocino County. I really wanted this to be a true pairing so I put a lot of effort into making appetizers that would highlight the wine. 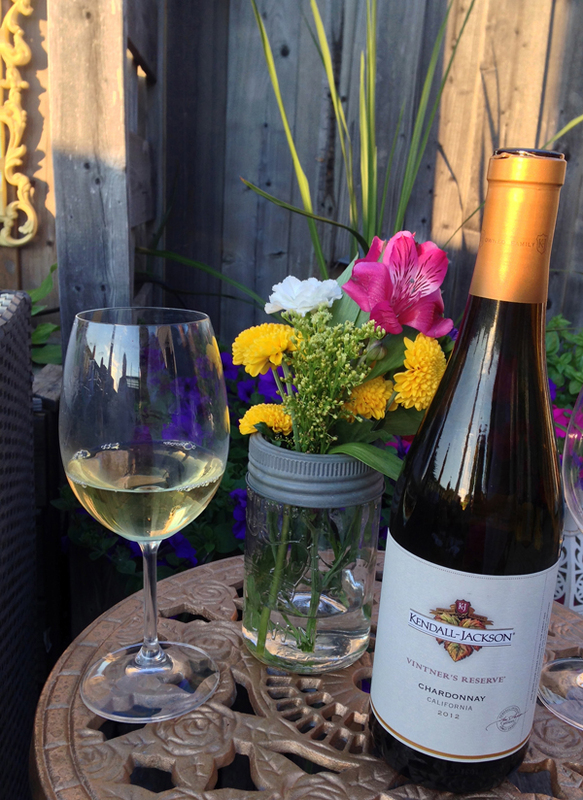 The Vintner’s Reserve Chardonnay is an especially food-friendly wine and pairs well with avocado, peaches, mango, mild cheeses, apples, shrimp, and potatoes amongst other things but those are the ones I decided to focus on. It was a bit of an experiment because a) that’s a bunch of different flavours and b) I’ve never made any of these recipes before. If I was in science class I think I would’ve gotten an A on this experiment. What your eyes are feasting on (clockwise from top left) is avocado hummus, ricotta & grill peach crostini, mini apple crisps, and spicy shrimp & mango with basil. 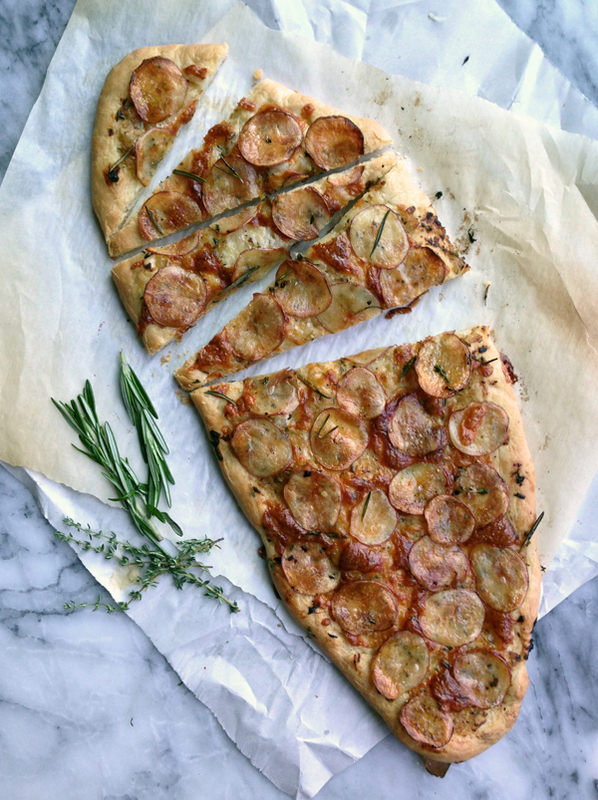 Below was the star of the show, a potato rosemary garlic pizza which also used chardonnay in the recipe, which you can find over on the Kendall-Jackson website. Stay tuned for some of the other recipes coming soon. 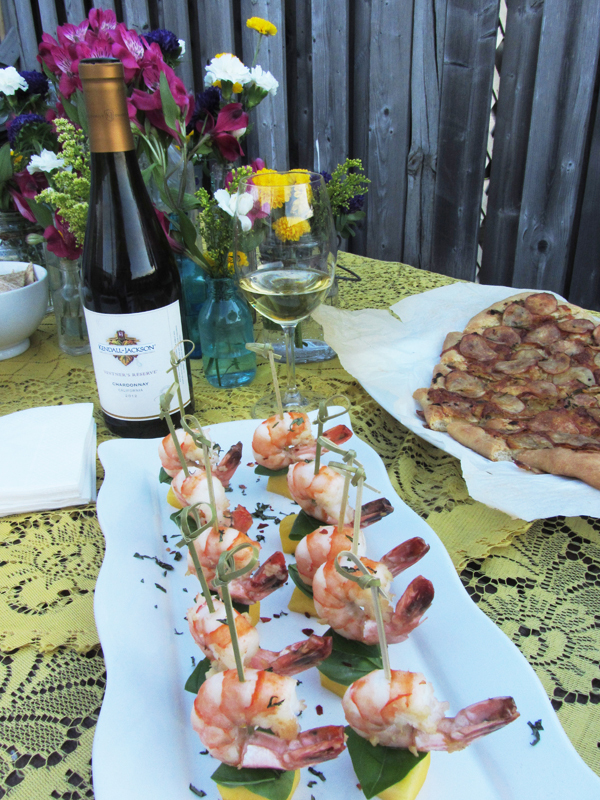 The Chardonnay had creamy tropical notes and paired perfectly with the food. The wine, food and good company made for a perfect evening of catching up, swapping stories and what summers are all about. 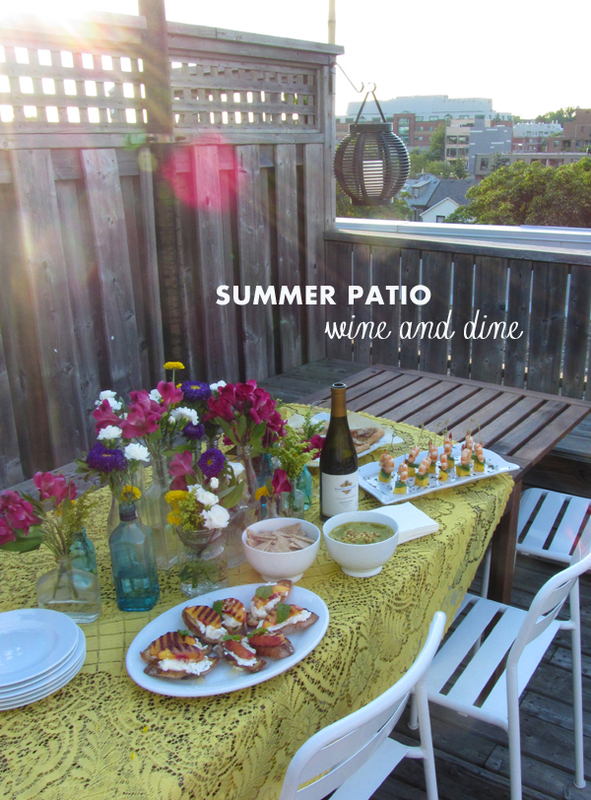 It was a patio full of happy guests with full bellies and (re)filled wine glasses. It’s not California but the view wasn’t bad either. I love how in the summer we are so much more open to being social and easy going about forgetting our schedules, especially on school nights. 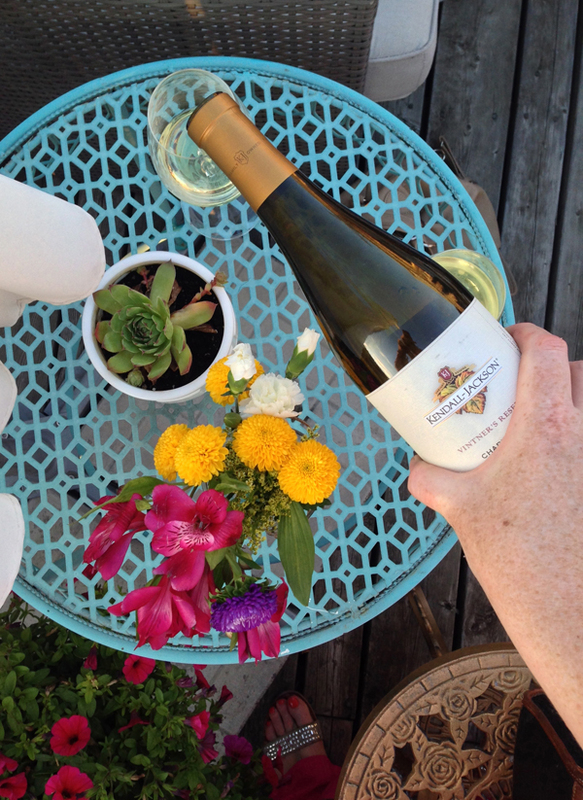 I highly recommend trying the Kendall-Jackson Vintner’s Reserve Chardonnay for your next summer shindig. Check out the vintages section of your local LCBO or wine store for a bottle. 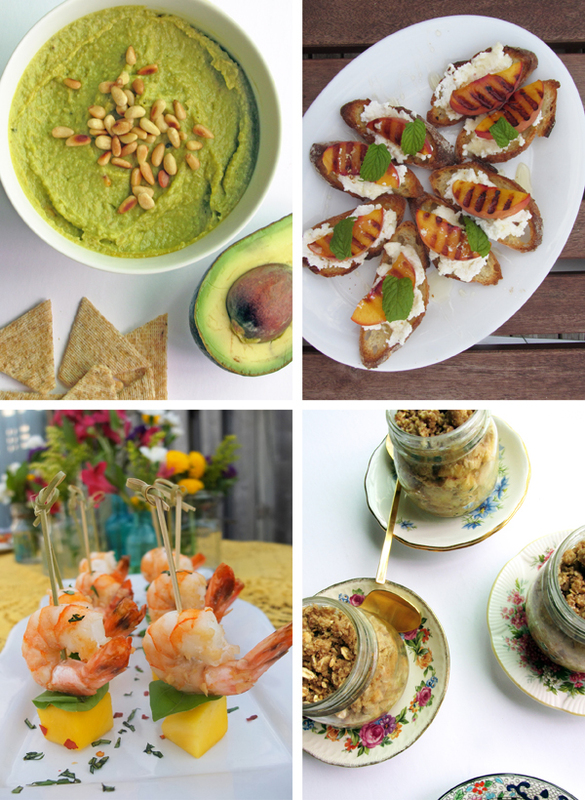 Try some new recipes to match or just some fresh bread and cheese for the perfect summer snack. The wine, good conversation and some warm dessert took us into the evening. In fact we came up with the saying “Chardonnays and Chardonnights”. Aren’t we just hilarious?! This post was generously sponsored by Kendall-Jackson Wines but all the opinions, creative concepts and content is my own. I will be trying that pizza recipe, it looks absolutely amazing! Ha! Thanks Kristen. Hint taken ;) Are you part of the Toronto specific Lifestyle Blogger group? We occasionally have meet ups. Ummm amazing. Looks like one seriously lovely evening. That pizza has my mouth watering…! This looks like a gorgeous evening!! Going to try those shrimp skewers and the peach crostini. We’re having a houseful next weekend, so your timing is perfect!! It was an amazing evening Melissa and you were the perfect hostess. The food was fantastic and the wine – well, I sure did enjoy the several glasses I had it was delicious. This looks like a delicious, I mean lovely party! Everything looks so relaxed, love the flower arrangements! Ohhhhhhh…. that looked fantastic! What a lovely way to spend an evening. The styling was relaxed yet charming! and the food… the food looked delectable! Looks so fantastic and delicious Melissa! Your parties always look so fun! This is absolutely gorgeous!! Amazing job!! This looks so, so pretty and delicious too. Love the pretty flowers in the old bottles, and the food and wine looks amazing. Looks so gorgeous! 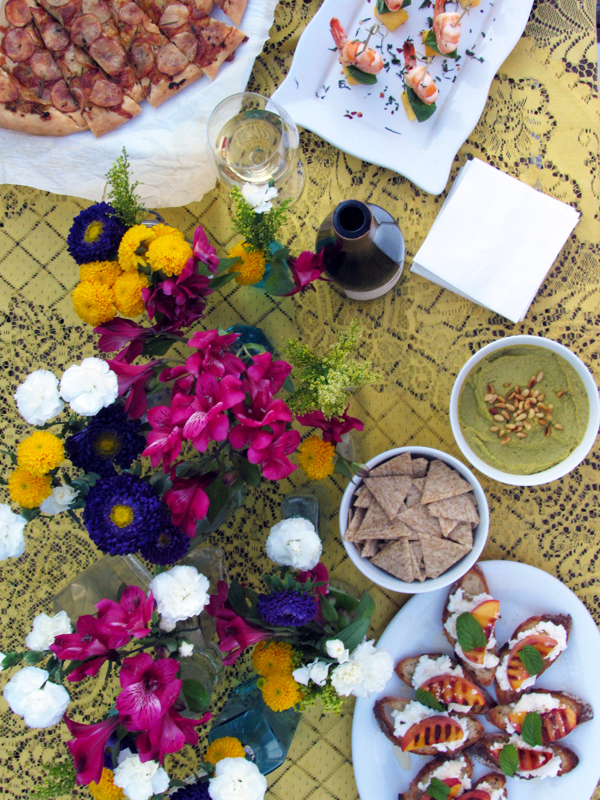 The food and the setting was beautiful – seems like the perfect summer night event. 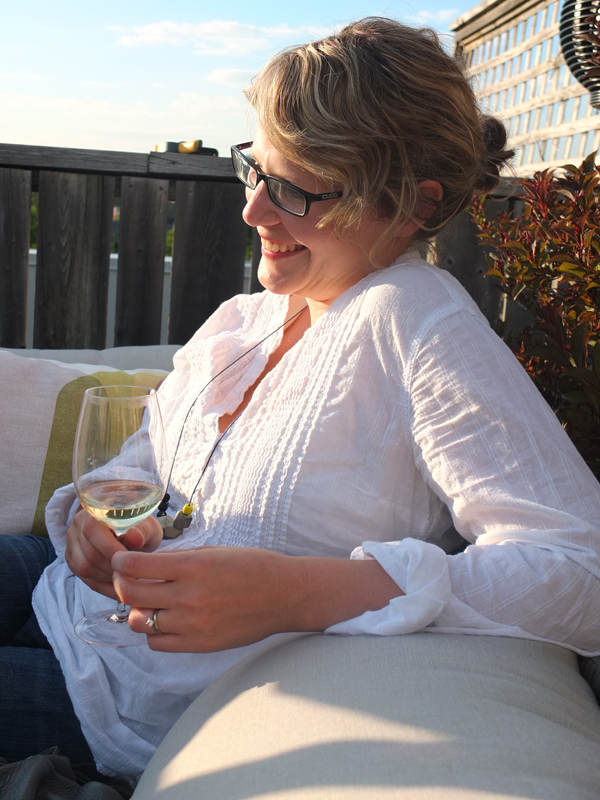 Thanks for the tips on the wine – I am always looking for recommendations. 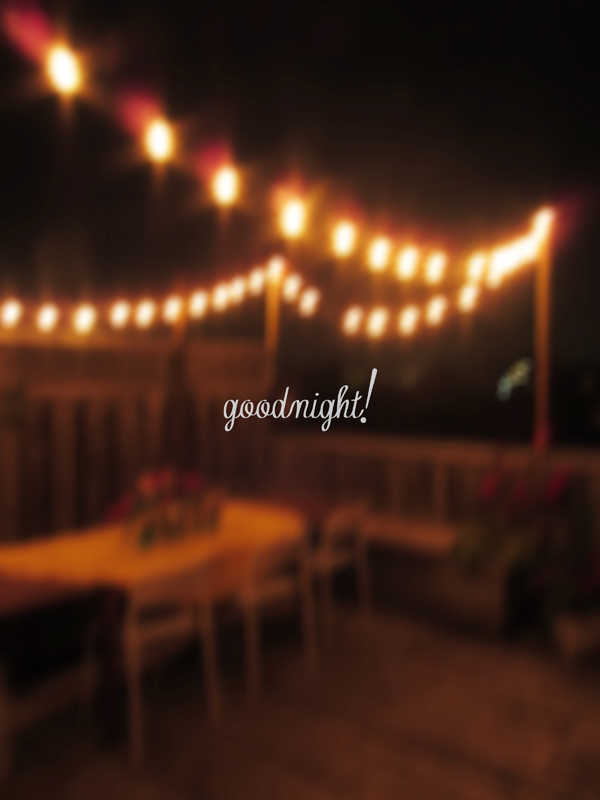 There is something so magical about little white lights outside in the summertime. Lovely patio party. That view, the food, and wine!! Oh my looks like an amazing night. The ricotta peach crostini looks especially good! This is gorgeous! It looks like such a fun evening!